Friday already, where has this week gone? I hope you have all had a good one and managed to get some crafting done. 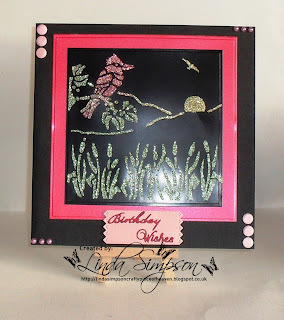 Here is another card I made using Evening Watch stencil with an assortment of Sparkle Medium colours from Imagination Crafts. 1. 8 x 8 Square black card which I have matted and layered red pearlescent card which has been cut out with Spellbinder Grande Square die. 2. The topper was made using Imagination Crafts Evening Watch Stencil and Sparkle Medium Gold Shine, Sage Green and Antique Pink onto black glossy card. 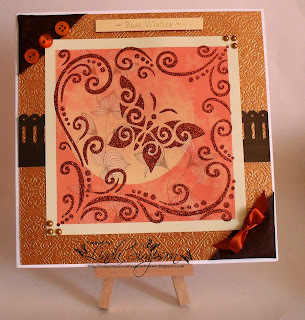 Once the medium was dry I cut this out using Spellbinder Grande Square die. 3 Using pink card I cut out the tag and added "Birthday Wishes" which are from Tattered Lace Sentiment die. 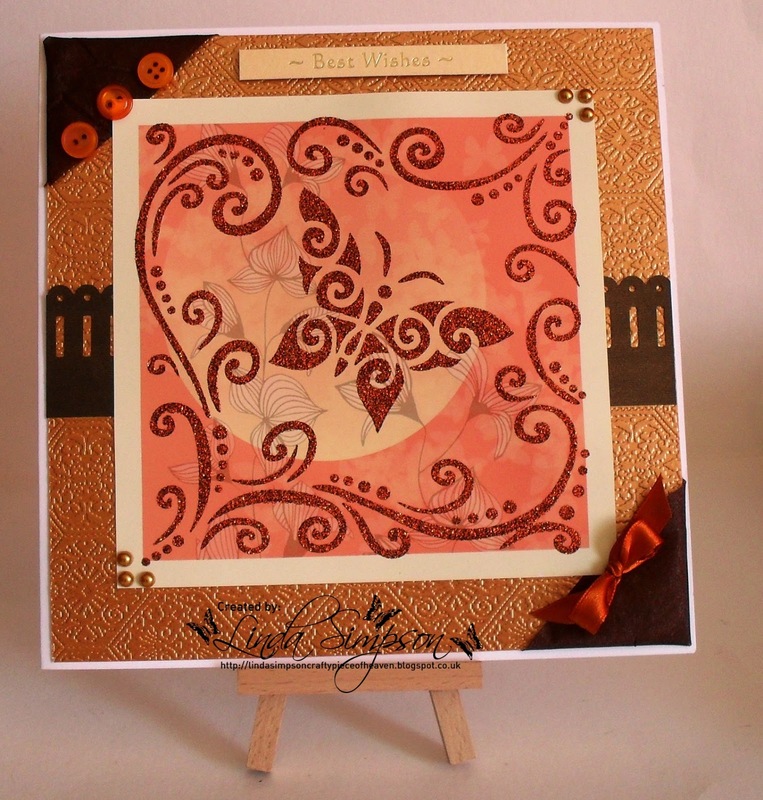 Here is a card I made last month using Imagination Crafts Butterfly Curls stencil with Sparkle Medium. 1. 8 x 8 white square card which I have matted the bronze patterned card from my stash and added ribbon on the two corners. 2. I punched a border strip with Woodware ribbon punch and then placed my topper which is from Imagination Crafts, onto this I have stenciled the Butterfly Curls with Amber Sparkle Medium. 3. I have added a bow to the bottom right corner and 3 buttons to the top left corner. 4. To finish off I have added pearl gems to the corners and a sentiment. That is all for today, enjoy your crafting. I hope you are all having a good week and managing to fit in some special crafting time ! Today I'm going to share one of the Imagination Craft's MDF Charm Kits I made, which was shown on the last QVC Show in July. I started by painting the back and the front of the board with mica powders mixed with Magi-Blend Solution. Cover the front with the brocade stencil and spread the three sparkle mediums over the it. Make two flowers from white card covered with sparkle medium. Make two leaves from white card covered with the Jade Sea sparkle medium. Glue to the top right. Cover a square frame with sparkle medium. 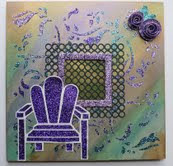 Put the garden chair stencil onto some white card and spread sparkle medium over it. When dry, cut out the seat leaving a tiny border of white card showing. Add some gold card to the aperture, then glue the green die-cut trellis over the aperture. Glue the square frame on top of the trellis and glue the cut out chair to the bottom left of the MDF board. That's the front finished. Now for the back of the MDF board. 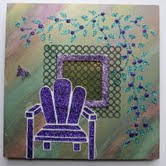 Lay the garden chair stencil onto the back of the board and spread Jade sparkle medium over the leaves only. Add some purple velvet detail sparkle to the leaves to look like flowers. Add some gold card to the aperture and the trellis die-cut as you did for the front. Then glue another square frame on top of the trellis. Punch out a tiny butterfly from left over card which has sparkle medium on it and glue to the left hand side of the board. Stencil another garden chair as before, cut out and glue to the left of the aperture.